I love thee to the depth and breadth and height of juicy fruit and tender crust. I love thee to the level of everyday’s most delicious bite by morning sun or candlelight. I love thee with passion as the best thing I ever ate. I love thee with a love only reserved for superior pie. Smiles, tears, pursuit of peach pie, my righteous path. 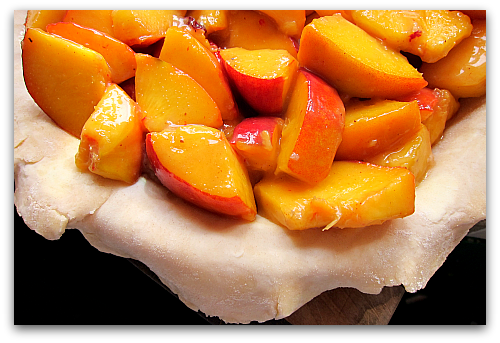 Let me share my favorite peach pie recipe so you too, can wax poetically (or not so poetically) over the virtues of delectable peaches crowned in crust. Counter intelligence: letting the pie cool before eating. 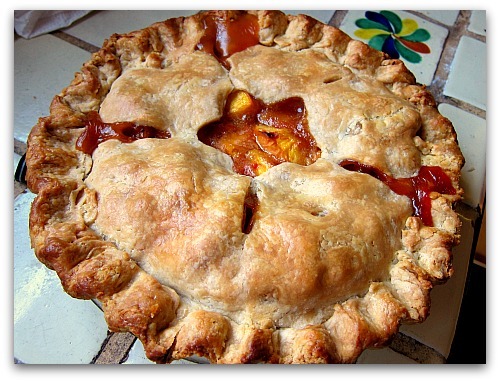 Adapted from a recipe originally published as Peach Pie in Country Woman July/August 2005. Cut peaches in chunks, not thin slices. I quarter mine and leave the skins on, then cut each quarter into thirds. Place peaches in a bowl, add sugars and let macerate until juice appears. Remove from heat, stir in lime juice and butter until fully incorporated and smooth. Pour cornstarch mixture over peaches. Stir gently and well. 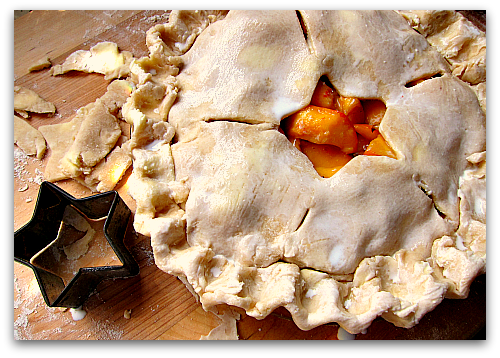 Add peaches to chilled pie dough in pie plate. Add lattice top or double crust top with air vents. Optional: whisk an egg with one tablespoon of water and lightly brush on unbaked top crust and sprinkle with sugar before baking. This adds a nice sweet crunch and golden brown top to the crust. Some days you just can’t wait for the pie to cool completely. Hi Tom ! The pie looks absolutely scrump !!! But, where do you get massive amounts of peaches ? Do you buy them by the case ? Thanks for the recipes and the delightful poetry too. I have been waternig the fig tree in hopes of coaxing the little buggers to start growing. Fingers crossed ! Brooks, both IGA and Thriftway on the island as well as Bernie on the corner will give you case pricing. Anytime I hear someone is going east of the mountains, I give them a $20 and say, please pick me up a case of peaches or nectarines. And thanks again for those delicious figs; I ate them all in various ways. Love the poetry and your photos are over the top. I can almost…almost taste that beautiful pie. Thanks for the kudos Susan. Food photography makes me hungry too! and thank you for your peachy inspiration! Alas, I have 3 Okanagan peaches patiently waiting for me. I might have to make a mini pie, or galette, now that I am drooling over your post. Oh my, oh my such glorious pie. I love the way you did the flutes so we’ll be imitating that as well as the pie if it’s OK with you! Love your poem too. Just say when you’re coming…Big Guy bought a crabbing boat yesterday and I can’t tell you how “beautiful” it is. We need you here and the fur kids are more than welcome too. Road trip! Thanks for such hospitality, I may just venture down to your paradise. This is perfect! I am just staring at a box of peaches and thinking, I have to do something with them today. Your double crust is beautiful, too! And yes, I think everyone will be imitating your crust. Eileen, hope your summer is going well; things are cooling off here a bit. Morning fog, and a high of 72, not bad if you ask me. Hi Margaret, all is well, but I’m moving slow this morning as I over-indulged on paella and BBQ yesterday. So good, but I showed no restraint in the potluck department. Sorry I don’t have a “twitter account” or a website! I am trying to catch up in this computer era but alas my brain is just not wired that way. . . . so I do a lot of “hunting and pecking” ! My 88yr old dad is still making and selling cat scratching posts. He makes them in his workshop and then sells them at local farmers markets. . . . He has a habit of picking up a little “something” for me and last Saturday he came home with a case of peaches (25 lbs) but they were not ripe, thank goodness! I left them in the box and they are ripening but some of them have rotted. That’s when I decided to “google” for information on how to ripen peaches and came across your site . . . . and even though I don’t usually “comment” on anything, I just had to let you know how delighted I was when I came across your website. You seem to be a man of many talents . . . I even loved your poetry as I feel the same way about peaches. I will definitely try your peach pie recipe and your “linen method” for ripening peaches in the future. Just wanted to thank you for making me smile today! There is my poetical attempt for the day. Your pie looks gorgeous. Lime juice? I’ve never seen it in a peach pie recipe; can you taste the lime, or does it give it that certain inexplicable something? Can’t wait to try it! Very nice Lucy, sweet words for a sweet dessert. As for the lime, I think it has a cleaner flavor than lemon juice. I feel its presence is masked, but yet it enhances the overall flavor and helps with color retention and thickening. 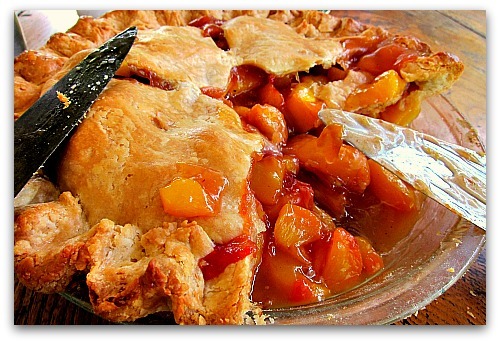 Just wondering – Can peach pie be frozen to be baked at a later time? 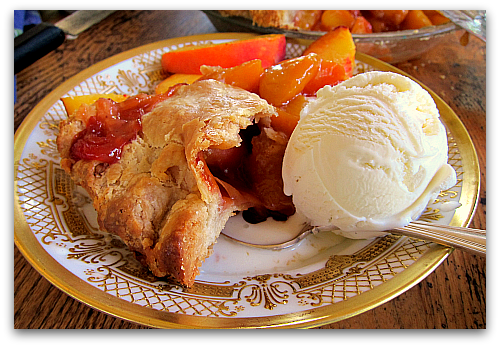 Am about to make your peach pie recipe!! Hello Tom, I’m a reader from Ohio and just wanted to tell you how much I look forward to reading your blog. (I have two sisters, one in West Seattle and the other in Aberdeen, Washington, and love the area.) I just pulled your pie out of the oven and can’t wait to try it – I’m sure it will be scrumptious! I assumed it was ok to add the vanilla and almost extract with the sugars, the recipe didn’t really say. Also, your crust looks absolutely delicious. Wondering if you could share that recipe sometime. I usually make a canola oil crust because of high cholesterol, tastes good but doesn’t look as pretty as yours. Thank you!